We have been working on developing modulated radiofrequency pulse schemes to enhance the central-transition signal intensity of half-integer spin quadrupolar nuclei under both magic-angle spinning and static conditions of the sample. 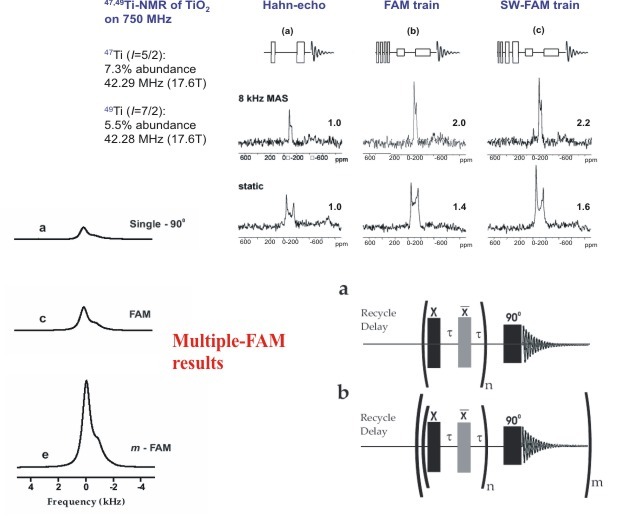 These schemes, based on fast-ampltude modulated (FAM) pulses, precede the observation 900 pulse and rearranges the populations across various levels to give central-transition signal enhancement. An elegant modification of the orignal FAM scheme was attempted by Thomas Braeuniger by sweepting the pulse duration and generating a FAM pulse train. This gives a marginal improvement over FAM in MAS cases, however, this is very effective in static cases. Two kinds of sweeps that have been attempted are a linear pulse sweep and a non-linear pulse sweep with characterisitc performance. 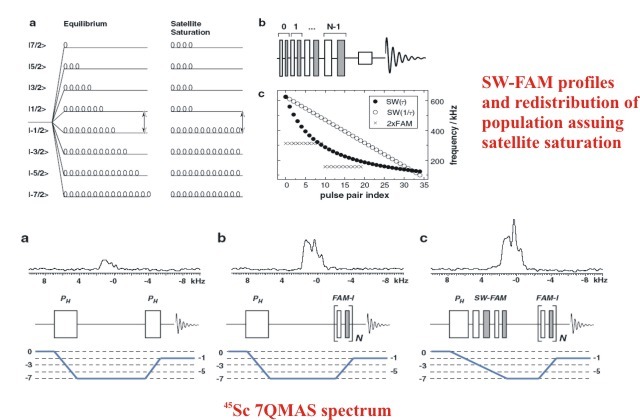 Theses swept-FAM (SW-FAM) schemes have been also inserted into the excitation part of 7QMAS pulse schemes with success. 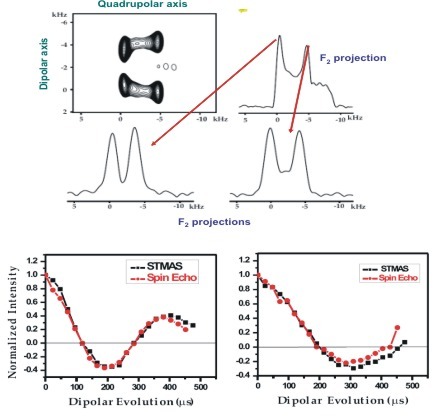 Repated application of FAM pulses, without allowing the spin system to relax, was shown to give enhancements of the order of 7 compared to single-pulse excitation under MAS. 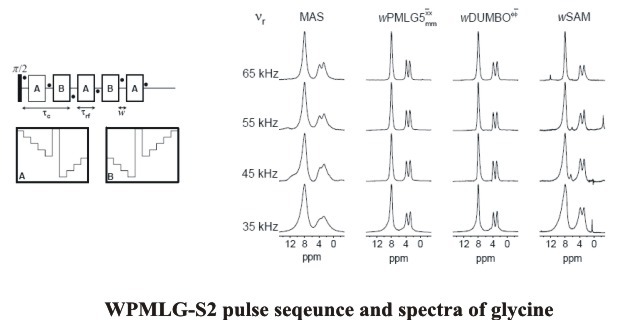 Schemes based on phase-modulated Lee-Goldburg (PMLG) and symmetry of the internal spin interactions are being developed/investigated to obtain high-resolution NMR spectra of protons in solid-state. We have recently demonstrated the implementation of PMLG at MAS frequencies up to 65 kHz. Symmetry-based R sequences have been shown to yield slightly better resolution than PMLG at MAS frequencies up to 35 kHz. We are currently in the process of investigating multiple-quantum spectroscopy involving protons at high MAS frequencies. A detialed Floquet calculation of the R sequences is on the way together with attemts to make it a windowed sequence. 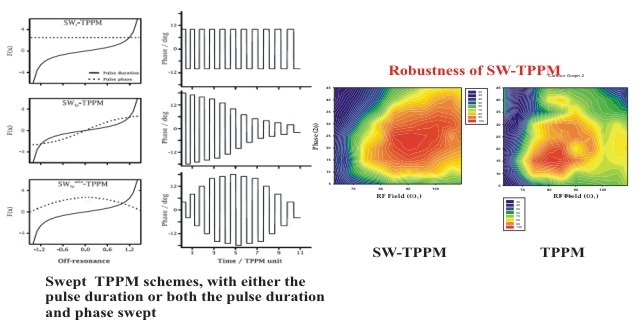 We have recently introduced a swept frequency version of the two pulse phase modulated (TPPM), SW-TPPM, that besides providing an enhancement in the signal intensity, also yields good performance robustness with respect to changes in pulse duration, off-resonance (of proton irradiation), and phase of the pulses. SW-TPPM is hence easier to set up. At MAS frequencies of 10-35 kHz, when the proton decoupling power is greater than 60 kHz, SW-TPPM seems to be the sequence of choice for heteronuclear dipolar decoupling. At MAS frequencies of 30 kHz and low decoupler power levels, TPPM does a good job, and SW-TPPM is just as good as TPPM. We are currently trying to understand the PISSARRO (developed by Tekeley and Bodenhausen) scheme and adapt TPPM to quench rotary resonance effects. Alq3 is a workhorse material for organic light emitting devices (OLED). We have done extensive characterisation of Alq3 in its various phases and in its facial and meriodinal isomeric forms. Characterisation has been done with the help of one-dimensional 27Al MAS and two-dimensional 27Al 3QMAS experiments and DFT calculations. We have used the isodensity polarisable continuum model which yielded the quadrupolar parameters in good agreement with the experimental values. This particular model has been since used in the prediction of various physical quantities of many compounds in our collaborators' laboratory. We are involved in the characterisation of several interesting zeolites being synthesised in National Chemical Laboratory, NCL, Pune, India. 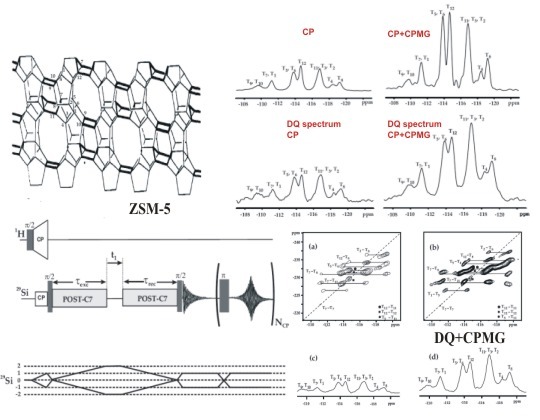 As a first step, we have performed Si-Si double-quantum dipolar recoupling in ZSM-5 using symmetry sequences (POST-C7) and incorporated CPMG pulses during acquisition to improve the Si signal intensity. We have been able to acheive at least four times signal enhancement. 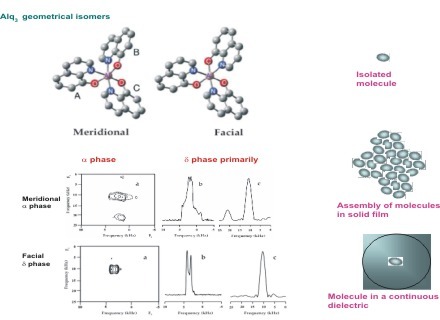 We are currently applying these methods to MCM zeolites. 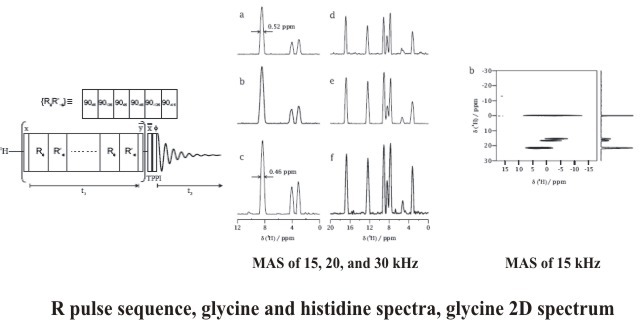 We have been investigating several O-H hydrogen bond systems in small organic and biomolecular systems. We use R-based symmetry sequences to recouple the O-H dipolar couplings which are then measured through modulations of spin echo, 3QMAS echo, and STMAS echo. We are in the process of implementing a 3D version of this experiment which can yield all the relevant parameters except the tensor orientation which can be obtained numerically. We recently introduced Fer expansion which can be used to obtain effectve Hamiltonians and propators in NMR under time dependent perturbation. This can be an alternative to Magnus expansion often used in Average Hamiltonian Theory. We are currently looking into the features of Fer, Magnus, and Floquet with respect to numerical calculations and convergence issues.